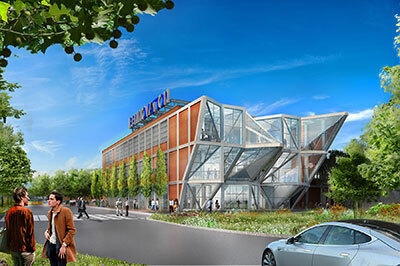 Conceptual rendering of Pennovation Center east and north façades. Courtesy of HWKN. The building’s northern façade bursts forth from the grid of the repurposed former industrial warehouse with illuminated angular panes of glass, reflecting the robust creativity and entrepreneurial activity taking place inside. It allows for natural light and unique views of the Schuylkill River, Penn’s campus and the Center City skyline. As a nod to the many startups that have previously begun in personal garages, a series of garage doors on the eastern façade open directly to studio spaces for some of the teams that will work in the building. The interior design includes a central bleacher space that organizes an open environment for events and a place for people to network and share ideas. This first phase of development at the Pennovation Works is a $37.5 million investment by Penn and includes the Pennovation Center, site landscaping and infrastructure improvements, along with signage and branding. The site planning calls for design of the Pennovation Plaza and surrounding landscape, which establishes a connection from the perimeter inward and forms a central active outdoor hub for tenants, as well as an instrumented, outdoor lab where the design and testing of robots within a netted enclosure provides passersby with an intriguing look into the developments occurring within the upper portion of the Center.